The first edition of this tool, released in March 2012, included identification support for 36 genera of flat mites, including specific diagnostics for 13 species of Raoiella, 14 species of Brevipalpus, and Tenuipalpus pacificus. The first edition had three Lucid keys, one to the genera of the family, and one each for species of Raoiella and Brevipalpus. The Raoiella key now includes 20 species (from 13), including several newly or soon-to-be described species. The Brevipalpus phoenicis species complex has been further separated into seven cryptic species. The tool now offers diagnostics for an economically important species associated with pineapple across the world, Dolichotetranychus floridanus. 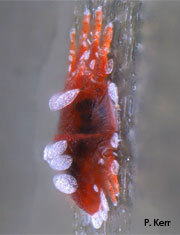 In addition to Tenuipalpus pacificus, a frequently intercepted mite included in the first edition, a recent incursion in the USA of an unidentified Tenuipalpus mite near T. crassulus sparked our interest in providing diagnostics for these two flat mite species associated with succulent plants. A key for 3 commonly intercepted species of Cenopalpus has also been added.